NEVADA CITY, Calif. February 1, 2019 – Heavy rains and strong winds forecast to start later this evening lasting through Sunday evening. Then, snow levels are expected to lower to 1,000 to 2,000 ft on Monday. 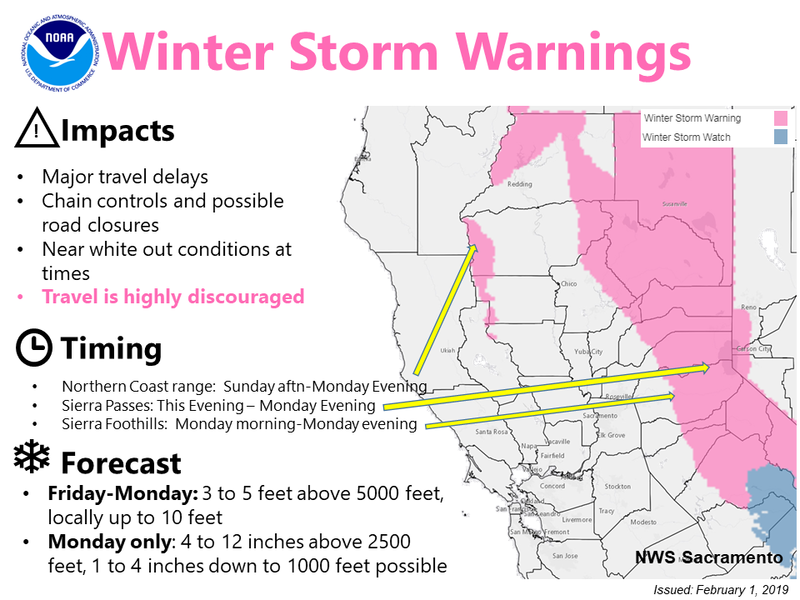 The National Weather Service in Sacramento strongly discourages any travel over the Sierra summits starting this afternoon. The full forecast is here. The strong winds are likely to cause power outages tonight into Saturday morning. Driving conditions will be hazardous due to very poor visibility and possible downed trees. If you don’t have to be on the road, please stay safely at home. Meanwhile, here are some tips to get you through the winter storm weekend. Have sufficient food and water for yourself and your pets to last for several days. Pick up any prescription medication you may need before the storm hits. Charge your electronic devices and check your flashlight and radio batteries. Be aware of changing conditions and monitor your local media for weather alerts and updates. If you are able, check on your neighbors. 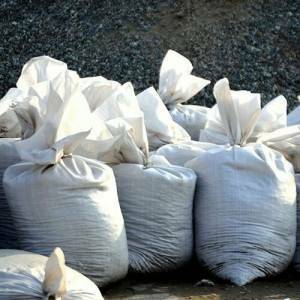 Sandbags are available throughout locations in the Foothills. Bring your own shovel, sand and bags are provided for free. Residents must bring their own shovel to fill the sandbags with sand. Sand bags are very limited, Nevada County OES requests that residents only take what they plan to use for protection of their personal property. For road failures and trees down in the right of way during business hours call (530) 265-1411 and call 911 for any emergencies. You can also report issues with County roads online with the Ask Nevada County web page or download the app in the App Store or Google Play. Foresthill: Foresthill Fire Protection District Station 90, 20540 Foresthill Road. Loomis: Town of Loomis Corp Yard, Corner of Rippey Road and Mandarin Court. Truckee: Truckee Fire Station 92, 11473 Donner Pass Road and Town of Truckee Corp Yard, 10969 Stevens Ln. Rock and mudslides on mountain roadways are likely. Reduce your speed, turn on your headlights and be aware of your surroundings. Travel could be very difficult with some roads covered by water. Turn around, do not drown. If you have a cordless phone or answering machine that requires electricity to work, have a standard telephone or cell phone ready as a backup. Keep your cell phone charged, and have a portable charging device handy. Freeze plastic containers filled with water to make blocks of ice that can be placed in your refrigerator/freezer during an outage to prevent food from spoiling. If you have a stand-by generator, notify PG&E and make sure that it’s installed safely to avoid risking damage to your property and endangering PG&E workers who could be working on power lines in your neighborhood. Information on the safe installation of generators can be found on our website at www.pge.com/generator. Stay away from downed power lines. Treat all downed power lines as if they are energized and extremely dangerous. Keep yourself and others well away from them and immediately call 911, then notify PG&E’s 24-hour emergency and customer service line at 1-800-743-5002. Candles pose a fire risk. Avoid using them during a power outage. If you must use candles, keep them away from drapes, lampshades and small children. Do not leave candles unattended. If your power goes out, unplug or turn off electric appliances to avoid overloading circuits and fire hazards when power is restored. Simply leave a single lamp on to alert you when power returns. Turn your appliances back on one at a time when conditions return to normal. Sign up for PG&E’s outage alerts, which provide customer updates via phone calls, texts or emails. Go to your My Energy account or click on www.pge.com/outages for more information. Check to see if other neighbors are affected. This will confirm if an outage is impacting the neighborhood or just your residence. If you don’t see your outage listed on our outage maps, report your outage to PG&E’s Electric Outage Information Line at 1-800-743-5002. Our phone lines may become very busy during major storms, and we appreciate your patience if you are trying to reach us.